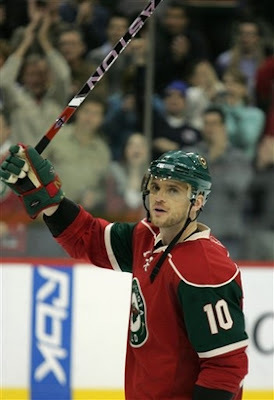 Marian Gaborik scored five goals and added an assist as his team, the Minnesota Wild, beat the Rangers 6-3 last night at Madison Square Garden. Gaborik scored one in the first period, two power-play goals in the second, and two more in the third to cap off an amazing night. "One time I got five goals when I was playing back home for a pro club back there, but this is just totally different," Gaborik said in the NY Post. “You score five goals in the NHL it's just a totally different experience. To reach it here with these guys in front of our fans is just unbelievable." The first five-goal game of Gaborik’s career was the first in the NHL since Sergei Federov in 1996. With the assist on Pierre-Marc Bouchard’s goal in the second Gaborik tied his career high with 6 points in a game. He last had six on October 26,2002 against the Phoenix Coyotes. Henrik Lundqvist was the victim of five-goal outbreak and allowed all six goals on just 18 shots and got pulled midway in the third after Gaborik’s fifth and final goal. He has allowed four goals or more in four of his last six games. "When you let in (that many) goals it's never fun, it's always tough," Lundqvist said. "You have to look at the goals, too. Is it me? Is it just a great performance by their guys? Then you just move on. Sometimes the key is not to think too much." This upset comes right on the heels of what was a big 4-0 victory against the Pittsburgh Penguins Tuesday night. That night Jaromir Jagr skated with Martin Straka and Scott Gomez and the trio combined for three goals. Straka has been especially hot lately he has four goals and an assist over his past four games. Rob Abruzzese's articles can also be read In The Dirt.